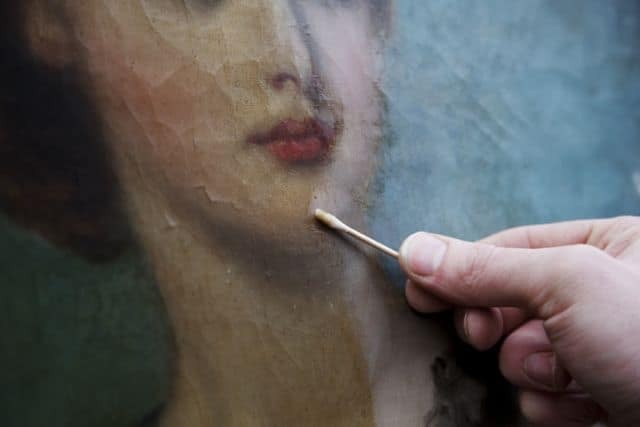 What Type of Artwork Damage Can Be Restored - Fine Art Restoration Co. Paintings can be damaged in different ways because of different circumstances. Whilst any painting damage is not desirable, a lot of it can be restored. Some of the more common damages that paintings encounter are listed below. If your painting is damaged in a way that isn’t mentioned here, get in touch with us and we can offer you some advice. Bleeding is when the paint from one area of an oil painting or watercolour painting spreads or runs into the area next to it. This can often be caused by water or other liquids coming into contact with the paint on the painting, making the paint runnier which causes the paint to soak into the areas around it. 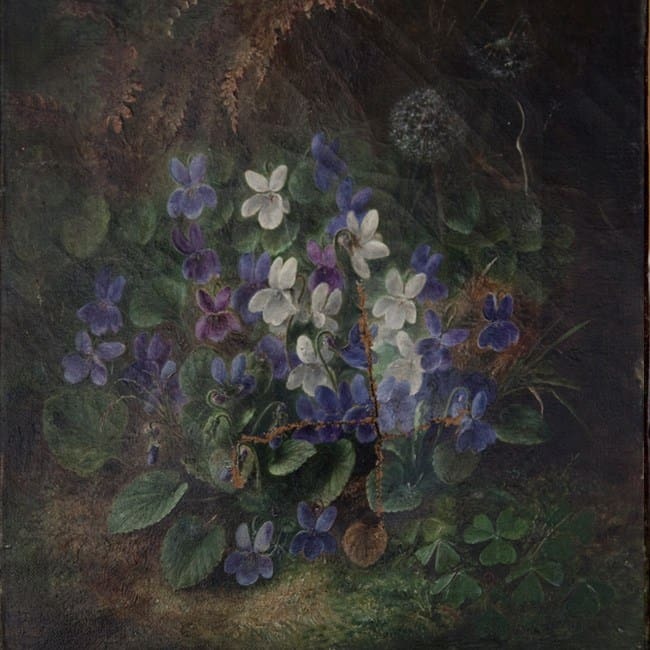 Bloom is when a cloudy or dull spot appears on the paintings varnish. This can make the painting look like it’s steamed up or foggy. This tends to occur as a result of being exposed to moisture. Cleavage is when the layers of the paint separate or lift off the canvas. This generally happens after the painting has already started to crack. It tends to look like the paint is flaking off. A blister is a raised area of the paint on a canvas painting that looks like the paint is bubbling off the painting or like there is water between the layers. If you touch the blisters the paint will most likely flake off. This indicates that the paint has started to lift (there is cleavage) between the layers. The paint used for oil paintings is made up of a solvent, pigment and an oil binding medium. When the paint dries, the solvent evaporates away leaving the pigment and the binding medium. If insufficient binding medium is used when the paint is mixed, once it dries, the paint becomes very powdery and unstable. This is called friable. The paint will look and feel dusty and just crumble away when it’s touched. If you don’t use the correct equipment to clean your paintings, the friction created between the painting and the cleaning tools can scratch the paint creating abrasions. Abrasions can also be caused where the frame of the painting touches the paint. The painting will look like it’s been scratched or have small areas where the paint has been rubbed away. Stress cracks are cracks caused by different types of pressure. Over the years the stretching of the canvas or the painting can be knocked, touched or bashed and can eventually cause the paint to crack and flake. 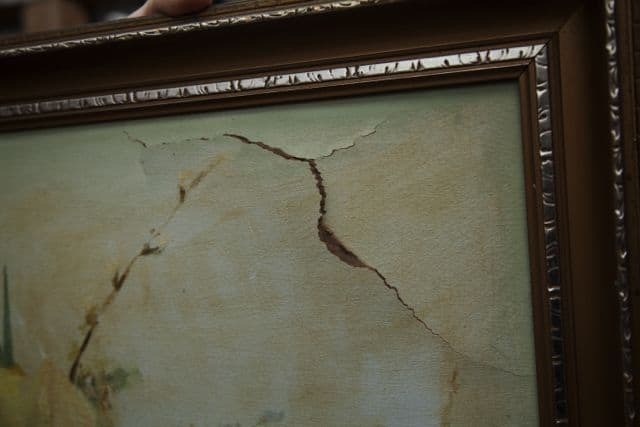 The cracks on the painting will look like they are being pulled away from each other and will become bigger if left for a long time. Traction cracks form when the varnish is painted onto the painting before the paint has properly dried. It gets worse as the paint slowly dries and shrinks. The layers of paint pull away from each other, leaving the bottom layer of paint visible. This makes your painting look scaly and shiny, a bit like alligator skin. These cracks are caused by repeated direct contact with an oil painting or watercolour painting. This can cause parts of the paint to flake off. It looks almost like a bullet has gone through a window, with the damaged area in the centre and the cracks spiralling outwards. A lacuna is a small cavity, hole or a rip in the painting. This is any kind of dirt which accumulates and builds up on the surface of a painting. This will make the colours of the painting look darker and the painting itself won’t be as crisp. As this will build up over time, it can sometimes be hard to tell how dirty your painting really is until it has been cleaned. Superficial grime is dust, grease, smoke or any small particles that accumulate on the painting or can be transferred by inappropriate handling. 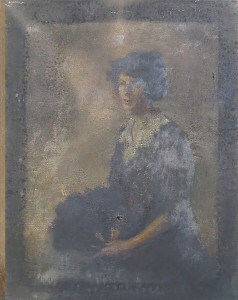 This can become imbedded in the painting which can make it very difficult to remove. This is a lot easier to identify than just dirt and grime as you will be able to see this on the painting, and in some cases areas of your painting may have changed colour, for example gone yellow due to the nicotine from cigarettes. Accretion is an accumulation of decomposed material and other material such as soil or rust on the surface of a painting. When this occurs, depending on the length of time it is left untreated, it can alter the original design of the painting. This is dried splashes and droplets of foreign material such as mud or drinks that have come into contact with the painting. The will look a bit like splashes on the painting. Stains look like dirty or discoloured areas of your painting. They are generally caused by foreign substances creating dirty or discoloured marks on the painting. It can in some cases also be caused by uneven aging of the painting. This is where someone has tried to restore a painting badly by painting over it. The painting will no longer look like it did originally. 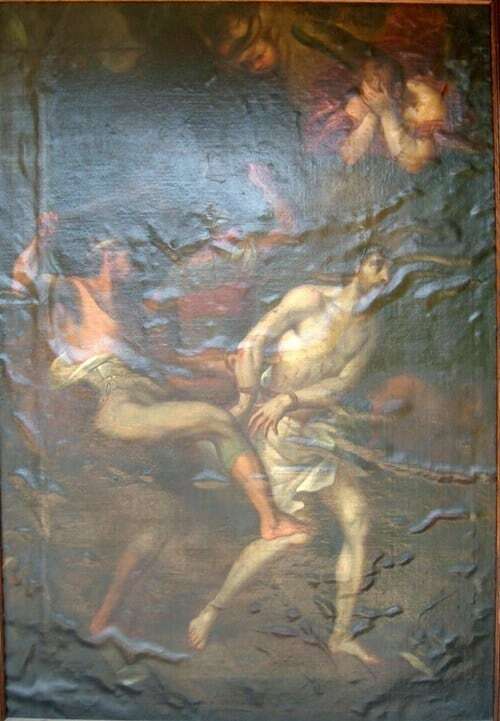 When artwork is damaged by water, the paint can lift and come off due to saturation. The water itself can also leave marks where it came into contact with the painting and these are known as tidelines. If a painting has been water damaged, the colours will look faded and depending on how clean the water is, it can look stained as well. When artwork comes into contact with smoke, soot can be deposited. In more serious cases, for example if the painting was in a building fire, more substantial damage to the fibres of the painting can be caused. If the smoke has nicotine in it, this can turn the painting yellow. The soot from the smoke will make your painting look darker, or even blacken it depending on the severity. 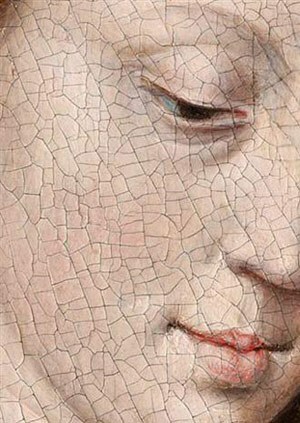 Cracquelure is when fine cracks occur in the paintings varnish. This is mostly due to aging of the painting. Your painting will look like it has a tiled mosaic effect.